Sadly, I think my Halloween posts are over. I don't even have time to think about the wonder that is the 31st until November 1st. I can't wait for next year though! Today we are going to be making something I have wanted for a really long time. 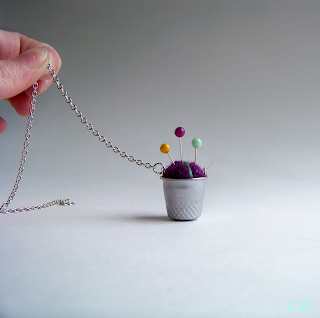 I saw the necklace that inspired this one a few years ago and I'm not sure if its the same one, but there are similar ones on shanalogic.com. That one is a little pricey though and I remember the one I originally loved being maybe even more. 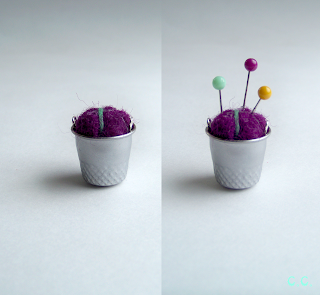 This DIY one was pretty cheap since I had everything but the wool. Heres how you can make one too! 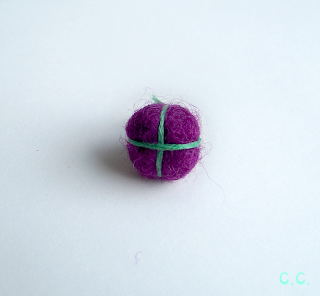 Step 1: Make a small felted ball. 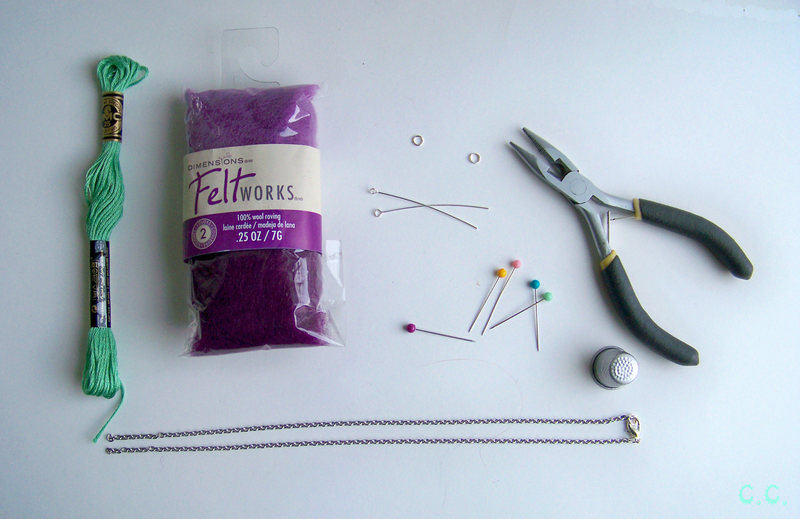 I have never felted anything (til now) so I learned from this quick, wonderfully informative three minute video. 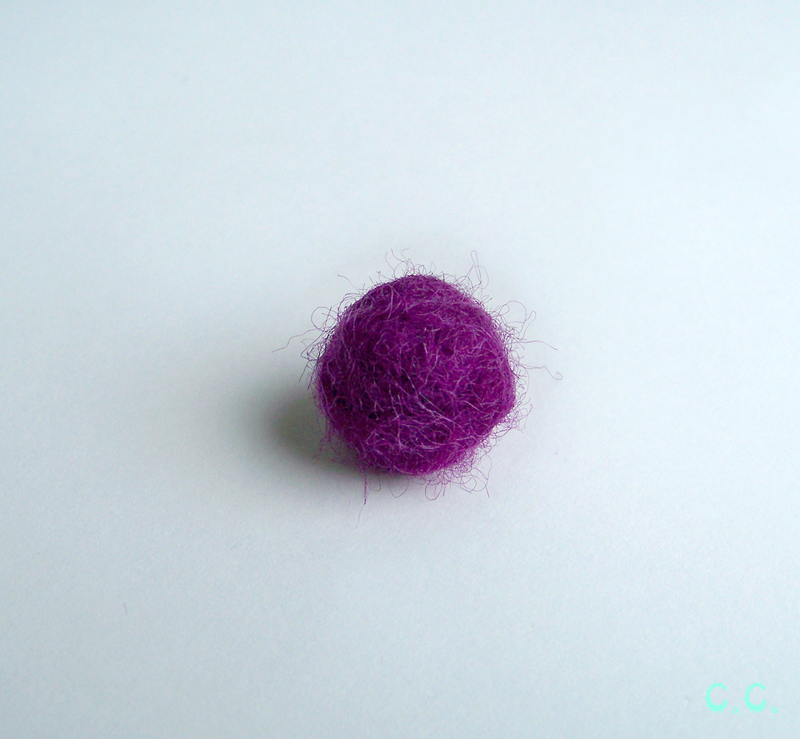 You will only need a very very small piece of roving. Mine was roughly 3 inches long and 2 inches wide and make sure its thin. A little lumpy but not bad! Step 3: Cut your head pins down to the height of your thimble. You want just the head to peek out over the rim. Apply glue (Either Hot Glue or E6000 works) to the length of the pin and glue the pis perpendicularly to each other in the thimble. 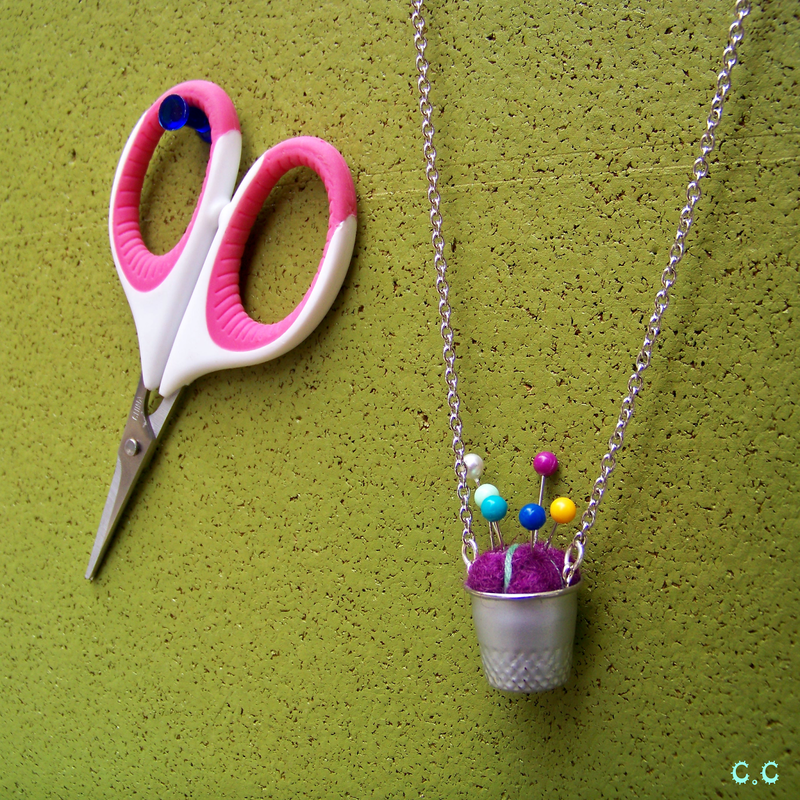 I used the pliers to place the pins in the thimble and press them to secure the glue hold. Yay tools! 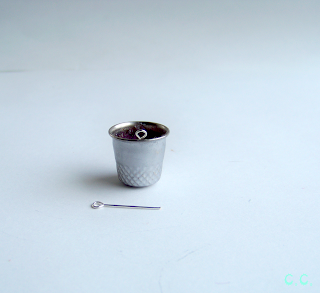 Step 4/5: Apply glue around the inside of the thimble, just a centimeter or so down from the rim. If you use hot glue: Place your needle felted ball in quickly so you'll have the most time to fix any mistakes as the glue will dry quickly. 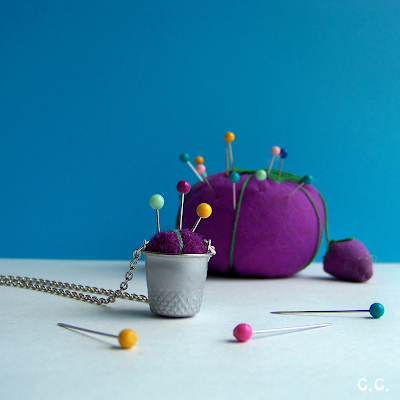 Then put pins in it! 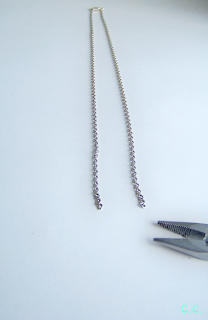 Step 6: Using your wire cutters, snip the link in the very center of your necklace, making it pendent ready! If you can't find the exact center just make sure that you even up the number of links on both sides. 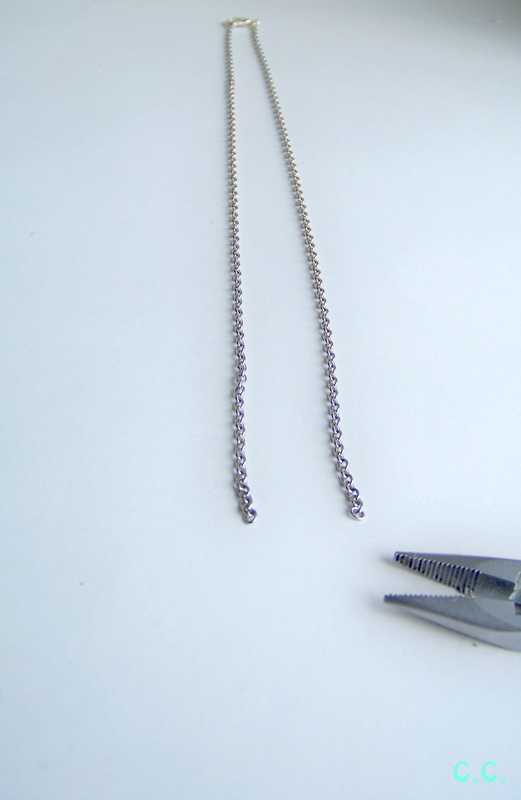 Step 7: Using the jump rings connect the ends of your necklace chain to the headpins in your thimble. Repeat with the other side. You now have a cute, crafty, functional necklace. ...I have been watching too much MDK. The puns are just word-vomiting out. 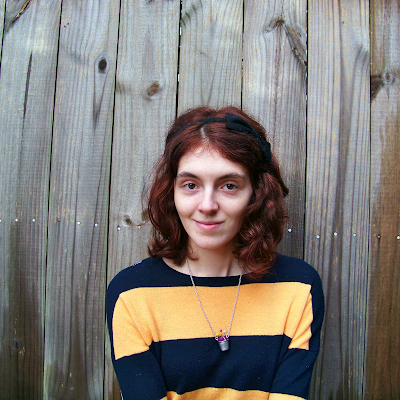 I took the dive and dyed my hair an auburn semi-permanently. I hope you guys like my knock-off tutorial! P.S. I learned a new blogging thing! I would love to see it when it's done! You are welcome, it makes me happy to know people are finding it useful! :) Thanks for the comment! No way! You just made my whole week! If not my month, I'm so honored! Thank you! Gah! Thank you! I wear mine all the time, it's my favorite thing ever! 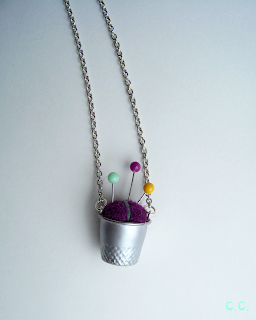 I will most certainly add it to my shop :) I'm sure people would love them in different colors for crafty friends and family :) I shall do the same! This is absolutely too precious! !